Here is why Pittsburgh is great – a lot of people – who love neat, old, awesome things – have been working very hard to organize an awesome day dedicated to all things vintage in Pittsburgh. 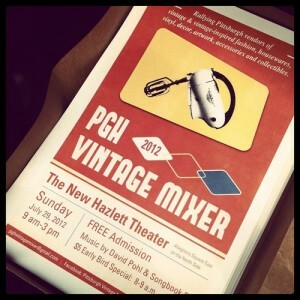 Meet the Pittsburgh Vintage Mixer. Brought to you by the folks that run the amazing online vintage shop – with the appropriate Western, PA name – Red Pop Shop! This will be a day full of vintage shopping from awesome vendors – see below, tasty food and excellent music. While I can’t promise all of these will be available on Sunday, here are some items that are available from the Pgh Vintage Mixer vendors online. A complete list of vendors is available here.